The most essential hunting gear that every hunter—a novice or a pro must own is a hunting knife. However, since there are lots of choices in the market, you can quickly get overwhelmed with the options. Hence, for today, we are going to take a look at one of the most reputable manufacturers when it comes to hunting knives. Allow us to introduce the Outdoor Edge. This company had been manufacturing hunting knives and gears for the past couple of years. All of their products are tested for efficiency in the field, and they are best known for their razor-sharp knives. 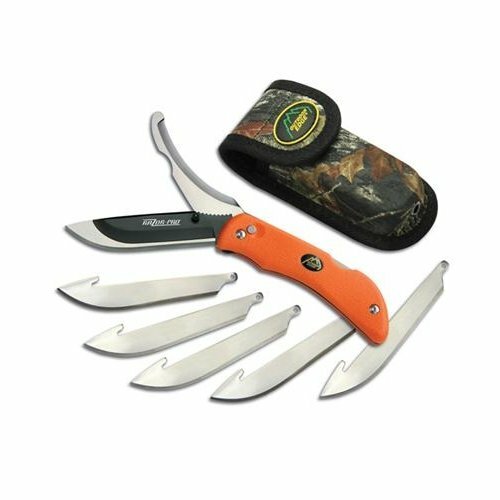 Their tools can provide you an even better edge, allowing you to get the hunting job done faster and easier. Now, let us take a look at the top 9 best Outdoor Edge hunting knives we’ve gathered in the market so far. The following are the most durable, budget-friendly, and high-performance knives that you should consider investing. First, we have the Outdoor Edge Game Processing Kit. It is one of portable butchering kit for dressing games, and it’s completed with all the items that you are going to need. It is most suitable for wild turkeys, waterfowl, small game, and even fishes. This kit features four useful knives that you can use for butchering. The blades of the knives are made of carbon 420 stainless steel, and its full tang construction assures you that it can last for a long time. The kit also includes a tungsten carbide V-sharpener, 10-inch double ground wood/bone saw, five ¼-inch carving fork, brisket spreader, game shears, 10 x 14” cutting board, set of six surgical game cleaning gloves, and a hard-sided carrying case to protect your game processing tools. If you want a budget-friendly and solo hunting knife, they also have this Outdoor Edge SwingBlade Drop Point Skinner. With just a single push of the button, you can quickly switch this big game cutting knife into a big game gutting knife. 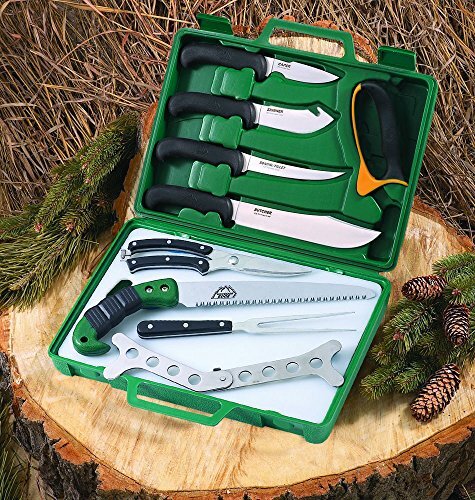 It is an ideal knife for using in a variety of works in the forest. It also features an innovative design cuts beneath the skin to open game easily like a zipper. Skinning a game has never been more comfortable with this product. It has a rubberized Kraton handle that ensures a definite and firm non-slip grip even if it’s wet. The blade is made of Aichi AUS-9 stainless steel, giving you the confidence to use the product ruggedly. 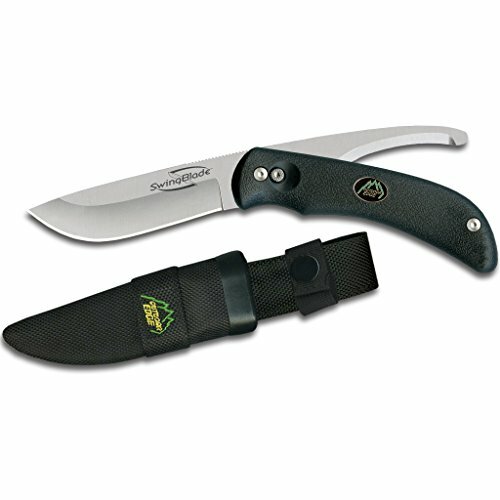 The package includes a nylon belt sheath, allowing you to carry the hunting knife wherever you want. This 3.6-inch skinning blade can turn into a 3.2-inch gutting blade anytime you want, making it an ideal hunting tool for both novice and pros. 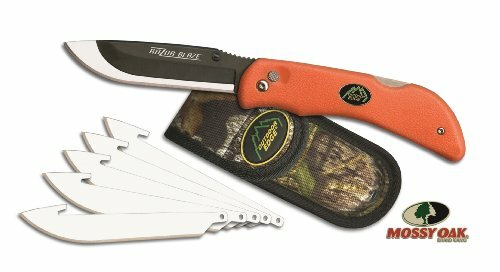 Now you don’t have to worry about dull edge again thanks to this innovative Razor-Blade Replaceable Knife from Outdoor Edge. This replacement razor blade system allows you to sharpen the blade when it gets dull, compared to other products in the market. You can remove the blade by just pushing the lock button, allowing you to sharpen the knife like a pro. Its vacuum heat treated 420 steel blade is ideal for hunters who are looking for excellent cutting performance. The size of this product is 3.5 inches only. This blade knife, similar to the previous product, has a rubberized Kraton handle that can assure you a non-slip grip. The Razor-Blade also comes with six complete replacement blades and a nylon sheath to keep your knife protected when not in use. 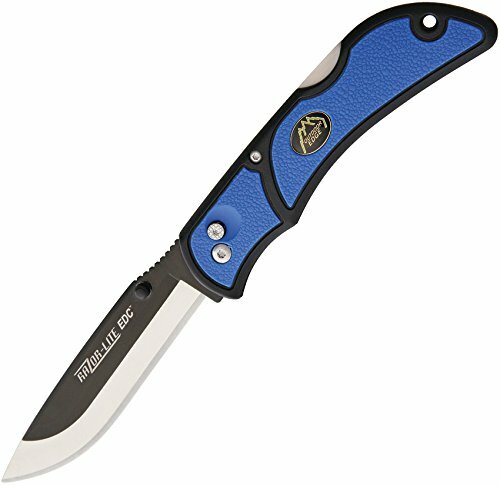 Check out the Outdoor Edge Razor-Lite Lock-Back Folding Knife. It is a vital hunting tool that every hunter should own before stepping into the woods. The knife features an excellent game processing functionality, allowing you to use it in a variety of hunting works such as skinning and dressing games. Its 240 steel blade system can be sharpened and replaced anytime you want. It also features a rubberized and non-slip Kraton grip, allowing you to gain full control of the product when you are using it. The length of the blade is 3.5 inches while its overall length is eight inches. The hunting knife only weighs 3.6 oz., allowing you to bring it anywhere you want without the hassle of being bulky. Allow us to introduce the Outdoor Edge Razor-Pro Double-Blade Folding Knife. 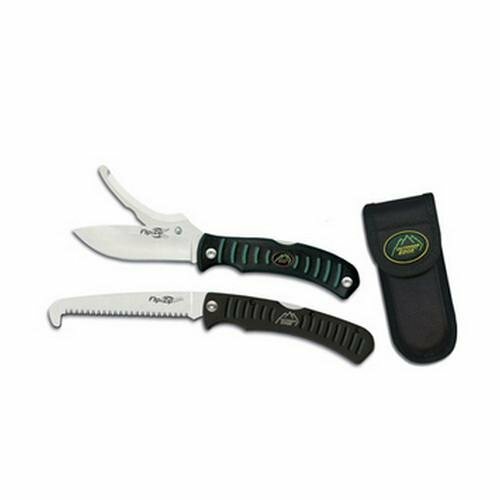 It is a combination of a 3.5-inch replaceable surgical steel blade with a stainless steel zipper blade that makes field dressing chores a lot easier. Its black oxide-coated blade holder ensures that the replaceable blade has full support compared to other hunting knives in the market. It also has a sharpness of a surgeon’s scalpel, allowing you to use the product in a variety of hunting works. The zipper blade guts big game is designed to minimize the risk of cutting hair or damaging internal organs when you are dressing big game. Its blade holder features a serrated thumb rest for improved control and a thumb stud for quick one-hand opening when you want to use the knife. Moreover, its replaceable blade uses a lock-back, and its zipper blade uses a liner-lock. The TPR handle is designed to provide a secure grip while you are using the product. This is one of the Outdoor Edge’s best-selling hunting knives. 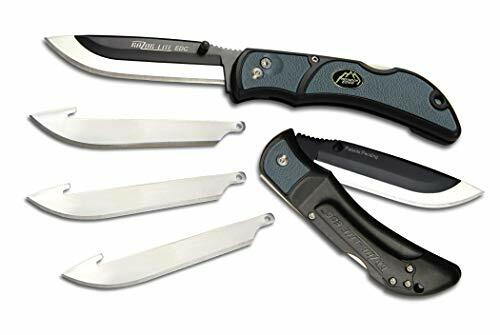 The hunting knife is the folding version of the acclaimed SwingBlade—the Outdoor Edge Flip N’ Zip Double Blade Knife featuring a traction-slotted Kraton handle. Its razor-sharp stainless blade is ideal for skinning, dressing, or even cleaning big and small game. The handle features a thumb stud, allowing you to open the folding knife using a single hand only. It also has flip-out skinning and cutting blades, making it a handy hunting tool when you’re alone in the woods. The length of the skinning blade is 3 ½ inches while the cutting blade is 3 ½ inches as well. 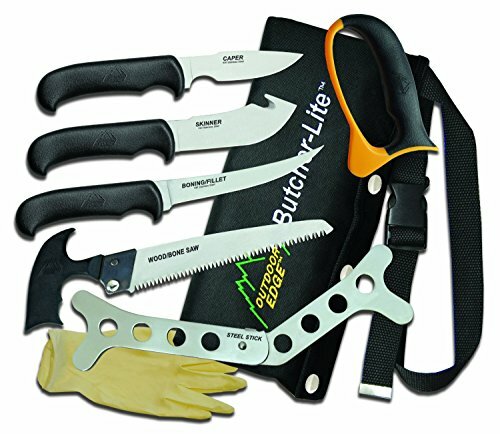 The Outdoor Edge prides their company on this Butcher Life 8-Piece Field Butcher Kit. If you still remember the first product that we’ve reviewed, this is another model from Outdoor Edge—an improved game processing kit that features a belt holder. Every tool that you are going to need when you are out in the field. The debone big game is neatly packed into a nylon roll pack that you can use as a belt sheath for easy access. This field kit is lightweight and portable, allowing you to carry it anywhere you want. It features a three-inch caping knife, a four ¼-inch gut hook skinner, a six-inch boning/fillet knife, a six-inch wood/bone saw, a tungsten-carbide sharpener, a rib cage spreader, and some gloves. All of them are fully-tanged constructed together with the taper-ground 420 stainless steel blades. Next, we have the Outdoor Edge Razor-Lite EDC Folding Knife. It features a built-in pocket clip on the Grivory handle, allowing you to carry the hunting knife anywhere you want. Plus, the Grivory handle is designed to reduce the actual weight of the knife, making it lightweight and portable. Its rubberized TPR inserts located on crucial grip areas allows you to secure a firm grip. The pocket clip is removable and replaceable. On the other hand, its black oxide-coated blade holder provides full support to any replaceable blade, allowing you to surpass performances of a standard hunting knife sold in the market. Its blade has a sharpness that can be compared to a scalpel of a surgeon. Its blade holder features a serrated thumb rest to provide full control when you are using the product. The dual thumb studs, on the other hand, is designed for quick and one-hand opening.